Albirex were irresistible as they completed a league and Cup double this season. 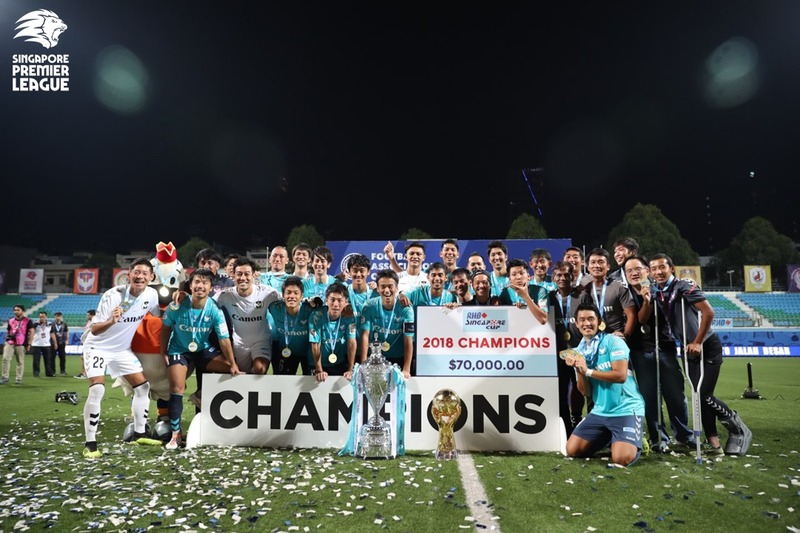 SINGAPORE, 6 OCT 2018 – Despite leaving top scorer Shuhei Hoshino on the bench, Albirex Niigata FC (S) still made light work of Brunei DPMM FC with a 4-1 win at Jalan Besar Stadium on Saturday night to clinch a fourth consecutive RHB Singapore Cup title. DPMM had not lost their last ten games in all competitions but more than met their match against an Albirex side that have now won all available domestic trophies for a third straight season. Captain Wataru Murofushi led the way with a well-taken brace to make it 13 goals for the season, underlining his team’s class as they extended their unbeaten run in the competition to 21 matches. The 4-1 win was also the largest winning margin in a Cup final since 2013, when Home beat Tanjong Pagar United FC by the same score. It was also the perfect send-off for Yohsuke Nozawa, who finished off with a 13th trophy since joining the club in 2015, as he prepares to head back to Japan after this season. DPMM’s night got off to a bad start when captain Shah Razen Said limped off injured after pulling a muscle while taking a shot. The White Swans took full advantage and duly opened the scoring after just 10 minutes through a good team move. Hiroyoshi Kamata skilfully took Shun Kumagai’s pass in his stride before squaring the ball for Murofushi, who slid it neatly into the bottom right corner from 12 yards. DPMM could have levelled matters eight minutes later, but Ukrainian frontman Volodymyr Priyomov lashed into the side netting from a tight angle. Adam Swandi then smacked a left-footed drive off the post, before Ryujiro Yamanaka lashed over from the rebound. DPMM failed to heed that warning as Kazuaki Yoshinaga’s men doubled their lead on 33 minutes. Kumagai capitalised on some uncertain defending to knock the ball down for Adam, who took one touch to steady himself before lashing the ball into the bottom left corner. Rene Weber’s charges reappeared for the second half with much more vigour, but could not trouble Nozawa as Priyomov and Azwan Ali Rahman both fired wide. Haimie tried his best to keep the score down for DPMM with a couple of superb saves, but there was no stopping the Albirex Express as they netted another two goals to add gloss. First, Murofushi received Kamata’s pass before curling a left-footed effort into the bottom left corner from the edge of the box on 64 minutes. Kamata then capped off an excellent night by sweeping home from close range eight minutes later, after Kumagai had held off a couple of defenders in the area to set him up. DPMM netted a late consolation three minutes from time, with Azwan Ali converting a cut-back from his older brother Abdul Azizi Rahman. Abdul Aziz Tamit’s snapshot was then brilliantly tipped over by Nozawa as the full-time whistle went shortly after, signalling another productive year for Albirex. Albirex Head Coach Kazuaki Yoshinaga: “Today was the last match that most of our players are playing in Singapore because they’re going to be over 23 years old next season, so I wanted them to go out, enjoy, work hard and get the win. It’s the club’s 15th year anniversary – it’s a wonderful club that has chosen me as head coach; we have wonderful players and wonderful support from the fans. The club will go on stronger from here and create history along the way with the good foundation. “This year we have two Singaporeans, Adam and (Shahul) Rayyan. We’re happy to have them on board; they have a winning mentality and I hope they can translate that to Singapore football. You can ask Adam how he improved daily as a player here. Although Rayyan never played a game, he has improved a lot from training daily with Nozawa. This year, I’ve seen the fitness level improving amongst local players. Last year, a lot of Singaporean players could not last 90 minutes, but many of them can now. DPMM Head Coach Rene Weber: “Albirex deserve to win because they did not lose a game this season and won all five games in the Cup. For DPMM, it’s important that we improved as a team, the way we play and the level of training. Albirex: Yohsuke Nozawa (GK), Riku Moriyasu, Shuhei Sasahara (Shuhei Hoshino 90’+2), Kaishu Yamazaki, Kenya Takahashi, Daiki Asaoka, Adam Swandi, Hiroyoshi Kamata, Wataru Murofushi (C), Ryujiro Yamanaka, Shun Kumagai. Unused subs: Taiki Itsukaichi (GK), Shahul Rayyan (GK), Kazuki Sumiishi, Kodai Sudaikawa, Ryuji Yamauchi, Kazuya Kojima. DPMM: Haimie Nyaring (GK), Helmi Zambin, Brian McLean, Abdul Aziz Tamit, Najib Tarif (Shafie Effendy 69’), Hendra Azam, Nurikhwan Othman (Abdul Azizi Rahman 79’), Azwan Ali Rahman, Adi Said, Volodymyr Priyomov, Shah Razen Said (C)(Abdul Mu’iz Sisa 9’). Unused subs: Wardun Yussof (GK), Azwan Saleh, Abdul Hariz Herman, Hanif Hamir.